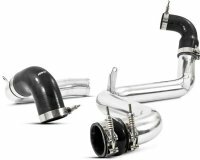 Unleash the hidden performance locked inside your Ford Focus ST with this intercooler pipe kit from MBRP. Constructed from show quality polished aluminum the 2.5 inch mandrel bent pipes provides a 22% CFM increase flow over stock for faster turbo spool and a denser intake charge. Built to withstand the pressures of performance driving this a must have for vehicles with an upgraded intercooler.